Wild garlic and wild onion are similar in appearance, but while garlic has hollow leaves onion leaves are flat; other plants such as crocus and star-of-Bethlehem have a white stripe. 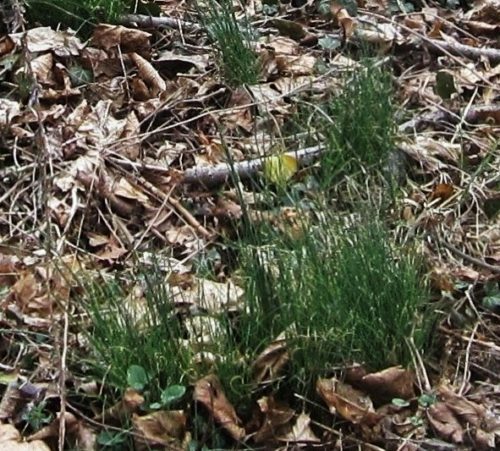 Both wild garlic and wild onion appear in early spring in lawns and open areas; both can be removed in the same manner; and both are edible with recipes found online. Be sure to properly identify the plants as similar looking species are poisonous. Dig and remove all of the underground bulbs when they appear, using a grandpa hand weeder or large screw driver. The best time is after a rain while the ground is damp. Click here for more information on uprooting wild garlic. Keep in mind that wild garlic bulbs can persist dormant in soil for up to 6 years and nothing sprayed above ground can kill dormant bulbs beneath the soil surface. Since any bulbs left on the ground may grow, it is important to bag , solarize, and dispose of them to ensure they can’t regrow. Persistent management for at least 3 or 4 years is necessary to obtain complete control.